Trina is artsy fartsy: Fake Blood Recipe and Halloween makeup tips! Fake Blood Recipe and Halloween makeup tips! Happy holidays everyone! It's that time of year again... that's right. HALLOWEEN. It's my most favorite of all favorite holidays and I'm so psyched that it's finally here! I've been very busy this month with ghoulishy fun things to do, including party for my 20th birthday. 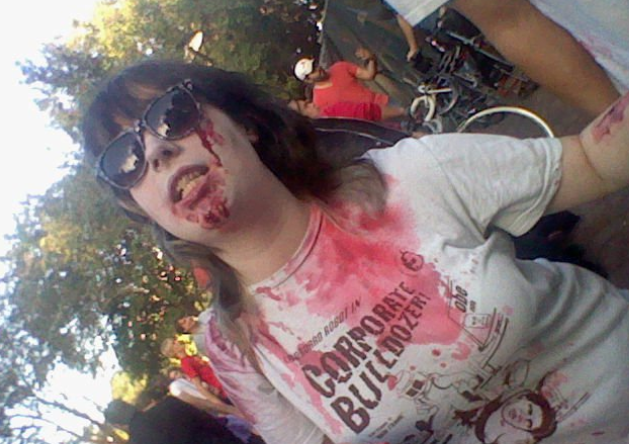 More importantly the Charleston Zombie Walk was this month! I'm so thrilled to have something like this finally in my neck of South Carolina, I've been both years so far and it's a blast. 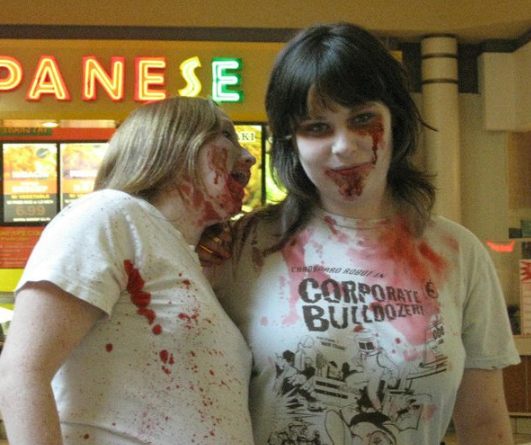 If there's a local zombie walk you can go to, make sure to go out and see! It's a unique, life long memory. In celebration of Zombie walk and bloody Halloween people everywhere, I've decided to share with you my perfect blood recipes! I was frustrated by the amount of searching I had to do in order to find these recipes. It was insane to me how quickly "how to" sites suggested you resort to using disgusting food items including applesauce, chocolate and even (gulp) ketchup. So needless to say, I'm against using gross and disgustingly sticky food items on your skin. I'm also against using the flimsy "store brand" of blood that they try to sell you. It's nearly 3 dollars an ounce, and the stuff doesn't even look slightly convincing. The recipes I use are simple and can be made nearly anywhere. I've personally tested these concoctions and used them on other people- all of which seemed impressed by the results. I have the photos to prove it! Blood results from Z DAY 2010 and 2011! I got all my zombie blood making supplies from Wal-Mart and the Dollar Tree. They're all household items, nothing fancy. Of course I got extra things, all you really need is the gelatin, corn syrup, coloring and extract. This blood looks amazing and dries solid while still giving the illusion of being wet (see zombie pictures above.) Once it sets on your skin, you won't have to worry about smearing it or sweating it off. It's perfect for giving dimension to your gore and wounds. Clean up for this type of blood is pretty simple, too. It flakes off evenly and is water soluble. This recipe has provided enough zombie blood for up to 3 or 4 people, but I always had some left over after using it. Unfortunately it doesn't keep for long (because the gelatin begins to solidify), so it always must be "made to order." Get it in the baking aisle of a grocery store. The exact water amount will vary depending on what affect you're looking for. "Dripping" blood would contain slightly more water, and goopy gore blood would contain slightly less. I suggest gradually adding small amounts of water until you find a consistency you like. The food coloring can be added next. Begin with adding 10-12 drops red (approximately) to your blood mixture. You won't need the entire bottle, just enough to thuroughly color your mixture. To darken up your blood, thus making it more realistic, slowly add blue and green by 1 or 2 drops at a time. For every 10 drops of red, 1 drops of each dark color will do. After application, don't disturb the blood and it will dry within minutes. OPTIONAL: I haven't tried this, but some recipes recommend you mix bits of tissue paper and cornstarch into your blood mixture. Apparently this should make it more chunky and textured, but like I said I don't really know for sure. If you try this let me know how it turned out! 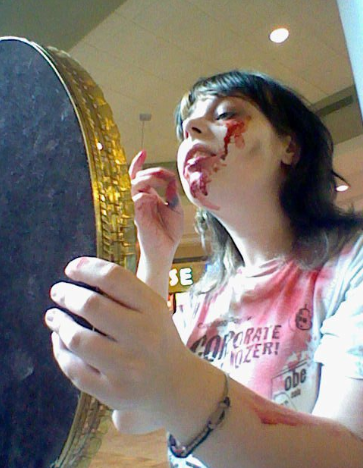 I know it's hard, but resit using the blood until all of your facial makeup is done! It will ruin your makeup and blood if you try to put makeup over all of of your freshly applied blood. Your bloodiness will look best if it's the finishing touch to your outfit. You can get bigger "wounds" if you work in layers. Let the artificial blood dry on your skin before you add more. It should stay mostly where you put it, and not run much at all. Give it 5 to 10 minutes to dry. Always test your concoctions before the big day! You will have to experiment a few times before you get something you're completely pleased with. Remember, if the blood seems too watery, wait a few moments for the gelatin to stiffen. Add more gelatin powder sparingly. If there is too much gelatin powder, not only will your blood not dry properly, but your mixture will be grainy and flaky. It may also dry too "tight" and not give as much flexibility on your skin. I know I said I was against sticky food blood, but this is stuff simple and necessary if you need a recipe you could actually eat. For example it went perfect with my with my Zombie Snookie outfit, enabling me to carry around a giant wineglass prop with "blood" inside it instead of wine. It's useful for Zombies and Vampires because you can get on your teeth and mouth. Try taking a swig of it and letting it gush out your mouth dramatically for a cool effect. I wouldn't suggest ingesting a ton of this stuff, though, because it's really thick and sticky, but it looks convincing and it gets the job done. Don't use this blood on your skin, either. It's mostly syrup, so it can get really messy and sticky fast. Add the syrup to a cup or container (like your prop glass.) Simply add in approximately 10-12 drops of red and 2 drops of blue and green. Once again, the blue and green add some darkness to your blood, making it less cartoon blood and more realistic blood. After that, just add a flavoring extract to disguise the taste of the corn syrup. My favorite is peppermint, but vanilla extract is also popular. Most grocery stores will have these basic baking items- they're probably even all mostly on the same aisle. OPTIONAL: I think that adding tiny amounts of water and cornstarch would make this recipe slightly less sticky. This is what I'm trying next year. I've tasted it before, and it actually isn't as horrible as it may seem. The extract completely masks any taste of corn syrup and its strangely tasty after that. This blood will stay liquid for a while, but you'll need to stir it every now and then to keep it fresh. If you're taking this blood mixture with you somewhere for some reason, make sure to keep it in a well sealed container. Avoid the disaster I had last year when it got all over my camera and zombie makeup supplies. Moar Halloween makeup applying tips! It surprised me to discover that many of my friends need serious help when it comes to Halloween makeup. It's pretty much the same as painting a canvas, except you're using really crappy materials. Even with that said, I have had a lot of success with the cheap "Wal-mart" brand cream Halloween makeup. Where I live, it's only $1 for an entire tube, and it lasts forever. The secret to dealing with this junk is that you have to work in layers. Patience is a virtue when it comes to certain mediums in art, and this is definitely one that takes restraint! Me applying makeup on Charleston's Z-DAY 2010. Work light to dark- Apply the lightest color first, then put the darker ones on top of that. Don't slather it on too thick- Start with 1 layer of your color at a time. You will have to apply more than one small "coat" of the same color to achieve an even tone. If you put too much on at once, you will get a muddy look. Use shading techniques- For example, don't just use black and white if you're going for a pale look. Use an array of different colors all lightly layered on top of each other. Instead of plain black, use black, brown and green in unison. You will be surprised by the effects. Don't forget the cheek bones- For some reason if you add some dark shading to your cheek bones your makeup looks better. I don't know why. Also, don't forget the rest of your body!- Your outfit extends beyond what your face looks like. A little bit of detail on your arms, hands, and even feet will push your look to the next level. Cotton swabs, a paint brush, makeup wedges and popsicle sticks! I will admit my favorite applicator is the makeup wedge. They were cheap (only a dollar for an entire pack at the dollar tree) and it applies the cream makeup really nice and smooth. Plus, everyone can have their own personal wedges and not have to dirty up their hands as much. I also like the cotton balls because they can give an unusual "grainy" texture to the makeup. For zombies, it looked more like decaying flesh than a smooth white face! Q-tips can be used to get tight details and for blending. The Popsicle sticks are used for stirring the blood recipes and heaping on big layers of the gelatin blood. They're cheap and you can throw them out when you're done! I stumbled around and yelled "GIAHHNNI!" in my best Zombie Snookie voice. Everyone got in on the zombie blood this year, from planners to procrastinators. LOL I loved everyone's zombie outfits this year. Zombie bananas and LMFAO zombies.. brilliant. Anyways, I hope my tutorials helped! As always drop me a comment if you liked this recipe, or have an even better blood concoction to suggest. I'm always looking for new ways to make blood muahaha.. Happy Halloween everyone!! I make this post look good. thank you for the tips on how to make the fake blodd. lifesaverrrr XP hahaaa thank youu really. Will the Non-sticky blood for skin stain clothes if it gets on them? Hey anon, since the color is food dye I would not risk getting this on your clothes if you're worried about stains. When it dries on your skin it doesn't really run or smear, but I'd be extra careful anyways if that is an issue.